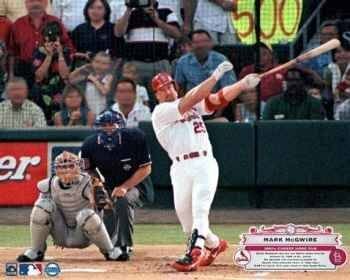 Mark McGwire, nicknamed Big Mac, was born in California on the first of October 1963. Considered among the most prolific and powerful hitters in MLB history, he ended his 16-year long career with 583 home runs under his belt. 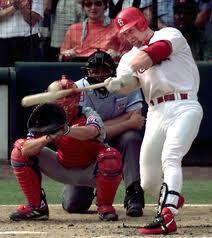 McGwire made the All Star Team proud on twelve occasions. He won the World Series once, bagged the Silver Slugger prize thrice, and the Gold Glove honors, the Home Run Derby, as well as the Lou Gehrig Award once. Despite such magnificent achievements in addition to 583 homers during his career, McGwire was not inducted into the sport's Hall of Fame. His hunger and passion for the sport was revitalized when he returned as a hitting coach for the Cardinals in 2009. Three years later, he was appointed as hitting coach for the LA Dodgers, where he currently plies his trade. Becoming a hitting coach has been Mark's dream ever since his playing days. Although Big Mac will be remembered for his incredible strength and powerful hits, speculation of steroid use during his career tainted his legacy shortly post retirement. He performed exceptionally well in the era where performance enhancing drugs were being used by several ballplayers. 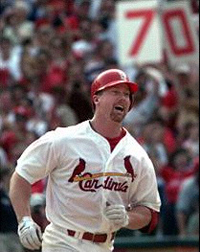 McGwire admitted that he was taking a steroid precursor that was then legal as he went about setting batting records during the late 90s. In 2005, along with five other retired and active MLB players, McGwire testified his use of steroids. His constant refusal to answer a few questions regarding his alleged use of steroids was taken badly by his fans and media, bringing scrutiny to a career of great achievements. What must be noted, though, is the fact that McGwire admitted to his use of steroids in a unique way that set him apart from the rest of the ballplayers who also admitted to using performance enhancement drugs. He came clean in 2009 when he admitted that most of his career as a player was made due to his use of steroids. He had kept everything to himself for years, but when he did decide to come clean, he admitted that it was extremely hard to call his sons, parents, family, close friends, and teammates. He left them messages, and it was the very first time that he had told anybody of his drug use. Although Mark took steroids during his playing days, he said that they had barely anything to do with the way in which he performed on the ballpark. He believes that he would have gone on to strike seventy home runs in a season even without using performance enhancement drugs. His belief may stem out of professional pride, but despite the fact that he cannot make the Hall of Fame due to the use of steroids, he believes that his career at least deserved the legitimacy for which he worked so hard. He says that he doesn't even recollect the names of the drugs he took for so many years, claiming that the doses were very low. He also admitted to trying HGH once or twice in his career.